Dinner time is around the corner. Me and Nicole manage to take a short rest in the hotel after an touristy adventure. We brought some snacks from 7-11 before heading back to the hotel. 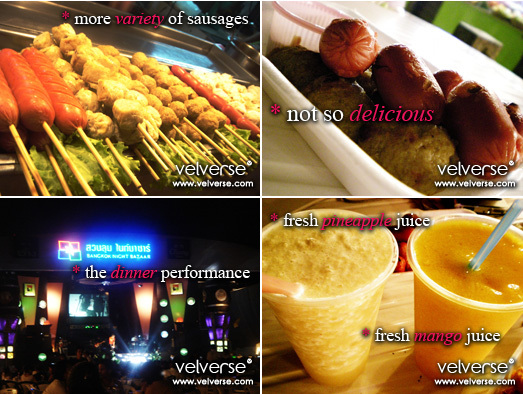 Munch on them… take a quick shower and decided to head down to Suan Lum Night Bazaar for some shopping and hawker food. The Suan Lum Night Bazaar is one of the biggest and most crowded night market in Bangkok. We were quite shocked to know that Suan Lum is still open. Rumours has it that the night market was closed down. I guessed they just decided to wait for us to visit it first. Suan Lum Night Bazaar is indeed quite a big place with loads of different small stalls. Me and Nicole was almost blinded by the amount of stalls and things to buy. For the first half an hour, we just walk pass many shops without even knowing where we should begin with. I finally understand why we can’t think straight and bought anything. Why? Cause I am walking around on an empty stomach. Me and Nicole agree that we should go search for food. We should search for stalls that sells sausages. Why sausages you asked? Cause… stalls near our hotel sells sausages and it has been tempting us for quite sometime. The funny part… we walk around but we practically can’t find any stalls that sells sausages. Of course we were quite disappointed. Thinking it was a big night bazaar, they would sell loads of different type of food. When we found the first and only stall that sells meatballs we quickly ordered a stick to try. It isn’t exactly what we had in mind to try but the well… since there isn’t much options… why not try it. Judging on it’s first look, it surely doesn’t look appetizing. The porkballs actually like they are not cooked. The first bite definately proves us wrong. It tasted so good. It’s really worth the 15 Baht. We actually sorta give up in searching for sausages and decided to just stop at the foodcourt and order whatever food that we like and eat. 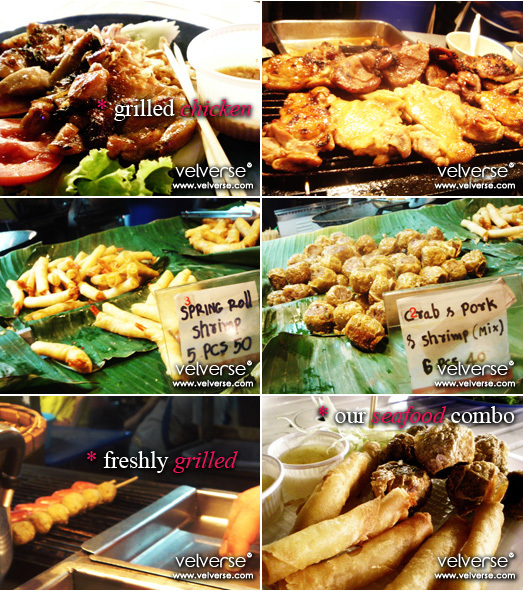 Yup, foodcourt is always the best place since one can really choose from the lots. There were so many stalls there… and so we walk and look around to see if anything interest us. Me and nicole were discussing how we should order more variety of food which is less filling. We walk and point around and keep in view of what interest us… when suddenly, we found this stretch of stalls that sells sausages, meatballs and many other snacks. 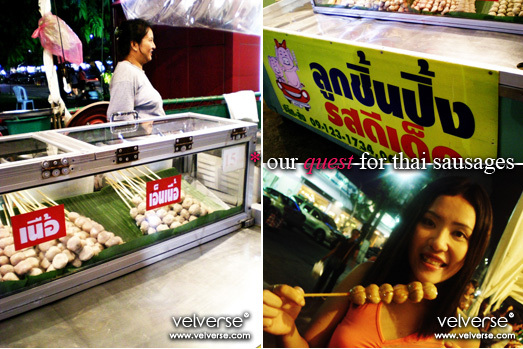 At the first stall, we ordered the Pork Changmai Sausage (15 Baht) and Garlic Pork Sausage (15 Baht). 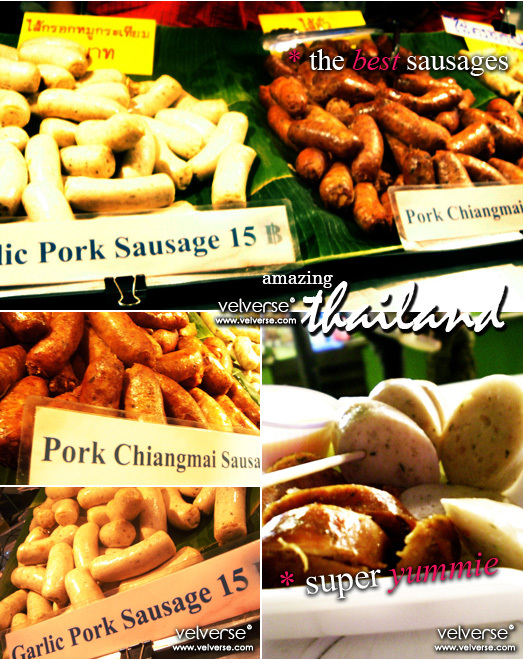 They both tasted extremely good but I prefer the Pork Changmai Sausage to the Garlick Pork Sausage. The Pork Changmai Sausage have this strong lemongrass and tom yam flavour. Spicy and a little sourish… wooo… definately one of the best sausages I have ever tried. We then decided to order some different variety of sausages and meatballs from another stall. The meatballs and sausages (30 Baht) didn’t really taste that good. In fact… I think it is kinda bad. From it’s outlook, it looks exactly like the sausages that you can get from the supermarket but the taste wise is really bad. There isn’t much texture to it. The sausages is practically too soft and have no meat taste to it. Same goes for the meatball as well. Definately the worst stuff we have eaten in the day. Then me and Nicole split up to make our final selection. She went and ordered Crab and Pork Meatball (40 Baht) and Shrimp Roll (50 Baht). I way prefer the shrimp roll to the crab and pork meatballs. I think the crab and the pork don’t kinda mix well and tasted a little odd. As for me, I went and order fresh fruit juice. I ordered Mango Juice (60 Baht) and Pineapple Juice (60 Baht). In my opinion it’s seriously a good deal. They seriously blend a whole mango to get that rich and thick Mango Juice. Wooo…. the juice tasted so rich. There were groups performing and singing… keeping everyone in the foodcourt entertained while we have our dinner. Right after dinner, we continue our walking session. Believe it or not… we didn’t buy anything. There are loads of things to buy… but I keep telling myself, wait and see… wait and see… we can always come back to this place and buy it later on. Which of course is true… it ended up many of the price was jacked up. I originally intended to buy some local designer artwork… which I think is god’s fate. I failed to purchase it because the artist left the shop to somewhere and not come back even after 10 minutes. And so, I decided to just leave the place. How sad eh?